JACKSON HEIGHTS — A long-awaited pizza chain restaurant opened inside the subway station at 75th Street and Roosevelt Avenue after years of delay. Famous Famiglia Pizza celebrated its grand opening on Monday, Dec. 9 with a ribbon cutting featuring local politicians and plenty of cheers. The store is donating all of the day's profits to Elmhurst Hospital's "Helping Kids Heal" fund, according to Famous Famiglia's CEO Paul Kolaj, who said they donate the full day's profits to a local children's charity whenever they open up a new store. The Westchester-based pizza chain won the bid to develop the long-vacant, 3,000-square-foot space in 2011, signing a 200-year lease. But full designs for the restaurant, according to the MTA, were not approved until March 2012 and construction on the large project began in April 2012. The restaurant's final designs were approved in late July, according to an MTA spokeswoman. Councilman Danny Dromm, who advocated for businesses to open in the busy transit hub since joining the city council, joined Rep. Joe Crowley and members of the Kolaj family to cut the red ribbon on the pizzeria. Dromm called it a "tremendous victory" and said the restaurant will help other stores in the area. "I believe that with the opening, it will help all the stores along Roosevelt," he said. "We're happy to be here," Crowley said, after trying a regular slice fresh out of the oven. "It really is a wonderful chain." 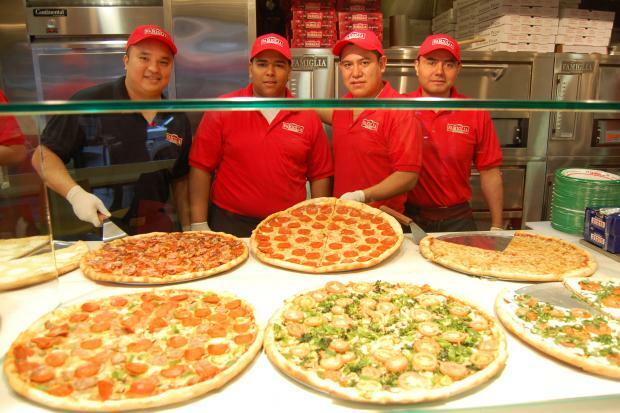 Famous Famiglia's CEO, Paul Kolaj, said the chain's Jackson Heights location is particularly meaningful for the family-run business, since they first came to the United States from Italy through John F. Kennedy International Airport in Queens. “We appreciate the partnership and support of the MTA and we look forward to creating dozens of jobs through a successful business in Jackson Heights, and for the opportunity to make our contribution to the local community," Kolaj said. "We really think Jackson Heights is a unique neighborhood indicative of New York City."